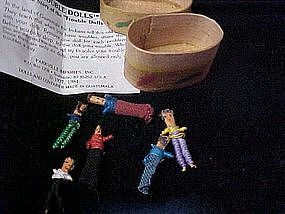 Set of little hand made dolls from Guatemala is a small balsa type wood box. Each little doll measures 1" to 1 1/2" tall. Made of paper mache, fabric and string. There are 6. Instructions & history included. Old Indian story from Guatemala teaches that when you have troubles, to share them with your dolls. 1 doll for each trouble. At night before sleep, tell each doll, and while you sleep the doll will work out and solve your trouble. Perfect condition and complete.